American research universities are part of the foundation for the supremacy of American science. Although they emerged as universities in the late nineteenth century, the incorporation of research as a distinct part of their mission largely occurred after 1900. To Advance Knowledge relates how these institutions, by 1940, advanced from provincial outposts in the world of knowledge to leaders in critical areas of science. This study is the first to systematically examine the preconditions for the development of a university research role. These include the formation of academic disciplines--communities that sponsored associations and journals, which defined and advanced fields of knowledge. Only a few universities were able to engage in these activities. Indeed, universities before World War I struggled to find the means to support their own research through endowments, research funds, and faculty time. To Advance Knowledge shows how these institutions developed the size and wealth to harbor a learned faculty. 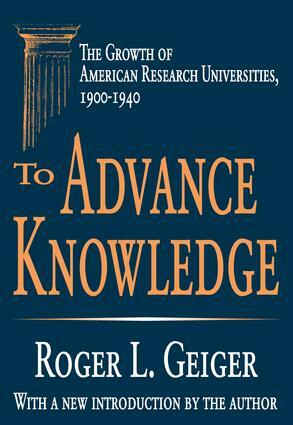 The book illustrates how arrangements for research changed markedly in the 1920s when the great foundations established from the Rockefeller and Carnegie fortunes embraced the advancement of knowledge as a goal. Universities emerged in this decade as the best-suited vessels to carry this mission. Foundation resources made possible the development of an American social science. In the natural sciences, this patronage allowed the United States to gain parity with Europe on scientific frontiers, of which the most important was undoubtedly nuclear physics. The research role of universities cannot be isolated from the institutions themselves. To Advance Knowledge focuses on sixteen universities that were significantly engaged with research during this era. It analyzes all facets of these institutions--collegiate life, sources of funding, treatment of faculty--since all were relevant to shaping the research role.